This shirt is one of a few I recently made for one of my clients. It is my original design, made from a hand-drafted pattern. Design details include a Front button stand and sleeve plackets cut on the cross-grain, and a Chevron Pocket. 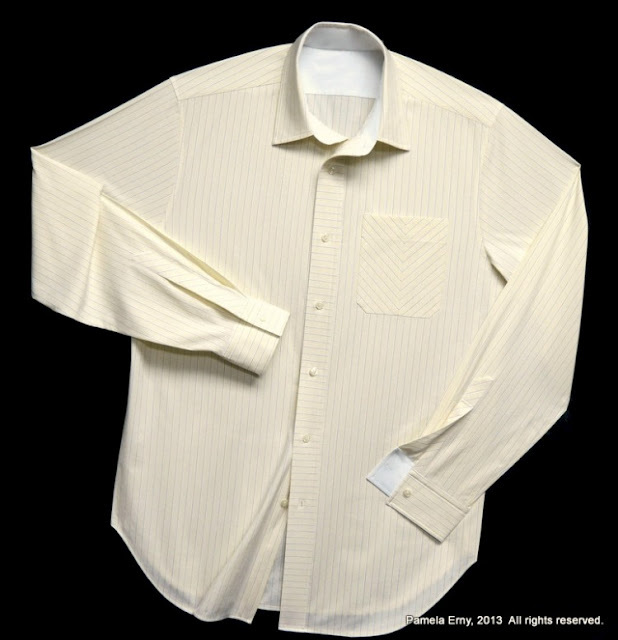 These beautiful fabrics, a yellow shirting stripe and white shirting fabric from GorgeousFabrics.com were especially fun to work with, since I usually do not use stretch wovens for the menswear shirts I design. Why so much fun? Instead of making my usual flat-fell seams, I used narrow french seams. Maybe it's just me, but I've found traditionally felled seams to be tricky to accomplish with stretch-wovens. So for the menswear shirts when I've chosen to use a Stretch-Woven, I opt to use french seams. For my own shirts in stretch wovens, I serge and top-stitch. Oh yes...when you've felled as many miles of seams as I have over my ShirtMaking career...the switch to French Seams is fun. Stretch woven fabrics naturally lend themselves to "Softly Tailored" shirts. So while this shirt appears to have a very crisp collar and very structured cuffs...they are in fact both crisp and soft. Yes, I know that sounds contradictory. But it all has to do with pairing the correct interfacing with the intended fabric. In order to have professional results, I needed to use an interfacing that would not fight the natural characteristics of the fabric, but rather, work with them. Of course, you know that this GoldenBrowndilocks Shirtmaker had just the right interfacing. In fact, I had thousands of yards of it custom-manufactured a few months ago. Pro-Sheer Elegance MEDIUM Fusible was exactly the right choice. Not too hard, not too soft, but just right for this shirt fabric and so many other garment and fabrics (stretchy or not). Pam this is gorgeous! I love learning more about the techniques and interfacings you use. It is such a privilege to read your information! Again, beautiful work, truly. Under the heading of "won't ever happen IRL but I wish...." I wish I could sit in your sewing room for awhile and just absorb your knowledge and skills! This reminds me of going to my hairdresser... "oh, just do this and this" she says... and somehow when I do it the result just isn't as polished and beautiful as when she does it. That's a very handsome shirt. Now show us how did that groovy and perfect chevron pocket! A beautifully tailored shirt and I love the chevron pocket. I can attest to how great this particular interfacing is and it sure shows here. I LOVE it!!! I especially love the play with the stripes. Brava!! I LOVE that interfacing and appreciate your giving me permission to use it in stretch woven shirts. As usual, the shirt is glorious. Good to know - it's a fabulous looking shirt, pressed within a millimetre of perfection. And I'm especially LOVING the chevron treatment at the pocket. Such a subtle, yet beautiful detail. It was the first thing I noticed! Such lovely work. I really like the chevron pocket. Thanks for sharing your work and wisdom. As you know, I, too, would love to be in your sewing room. Gorgeous, and great interfacing recommendation and info. I think choosing interfacing for stretch wovens is one of the most challenging things most sewers face. Thanks for sharing your expertise with us. Beautiful work! I was just wondering about stretch woven shirt fabric the other day when going through my stash--now I have the answer. Thanks!